Facial expression lines develop from the action of the underlying muscles on the skin. Although these lines help us to convey to others a range of emotional states, some facial expression lines always seem to connote fatigue or anger, even if those appearances do not represent how we are feeling. This is especially true of lines of the forehead and between the eyebrows. Other lines, such as crow’s feet, lip lines, and neck furrows for example may make us appear older than our chronological age. Botox® is used to block the nerve impulses that tell those muscles to move hence it is used to treat wrinkles that are formed when you make facial expressions. This reveals a more fresh looking, healthy appearing, you. Botox® is a FDA approved purified protein naturally derived from the bacterium Clostridium Botulinum Type A. It has been used for more than 20 years to reduce unwanted muscle activity, and is considered safe and effective. Initially introduced for treatment of ophthalmologic and neurological muscular diseases, it is now also used for the cosmetic reduction of facial expression lines. As noted above, lines and wrinkles develop, at least in part, from the action of facial muscles under the skin. The muscles of the face are directly attached to the skin and move the skin. After years, furrows may remain along these facial expression lines even without any active facial muscle expression. The development of these lines is further enhanced by lifestyle choices: years of sun exposure, smoking, and unhealthy diet are the most notorious! Botox® is capable of minimizing or preventing the unwanted facial expression lines by stopping muscle activity which will improve or blend the wrinkles that are visible while the muscles are at rest. Botox® acts by immobilizing the muscle at treated sites. It does this by inhibiting contraction of the targeted muscles. Only those muscles producing these undesirable lines are treated. 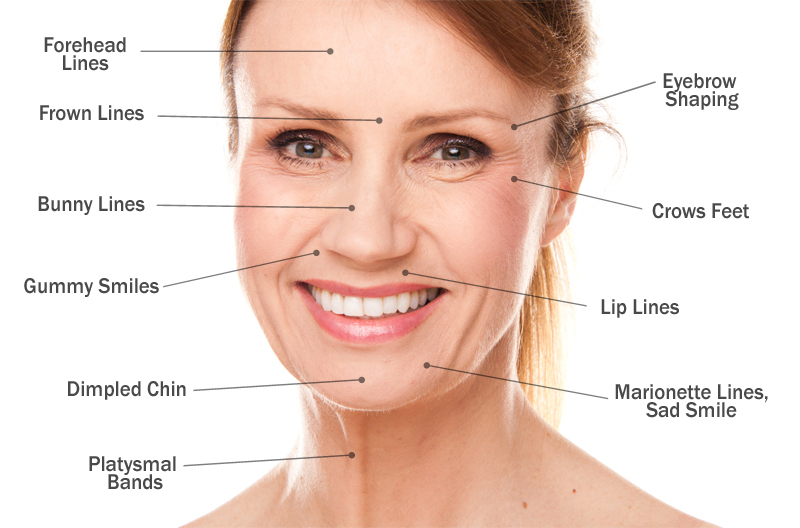 In what areas can you use Botox®? Botox® is FDA approved only for the treatment of the lines between the eyebrows (glabella), but it has been used safely “Off Label” by millions of individuals to treat crow’s feet, smoker’s lip, neck bands, and forehead wrinkles. The treatment takes only a few minutes and the BOTOX® initially takes effect in three to four days with the maximal effect seen in about 2 weeks. Patients can return to work or other activities immediately after treatment. When Botox® is injected there is a minor sting for a few seconds. Once the injection is complete, there is usually no discomfort. Most patients report mild discomfort that subsides within a minute. Ice can be used before and after treatment to minimize this feeling. What kind of facial lines does it remove? Prominent facial expression lines, especially horizontal lines on the forehead, vertical lines between the eyebrows, and crow’s feet are most dramatically improved with treatment. See picture below for other areas of treatment. How does Botox® compare to other products such as filler materials? Unlike filler materials, Botox treats the underlying cause of the facial expression lines. Filler materials, such as Restylane or Juvederm, plump up the skin. Although fillers reduce the appearance of lines when there is no facial expression, the moment the person does smile or frown, the lines reappear. BOTOX® actually prevents the unwanted lines from appearing with facial expression, and often even at rest. These two products work best together to help maximize the desired results. A small quantity of solution is injected directly into the muscles that are the cause of the prominent furrowing or expression lines. Typically several injections into multiple muscle groups or areas are given with each treatment. One treatment is usually effective for 3-6 months. Each patient metabolizes BOTOX® at different rates so the treatment may last for variable lengths of time. Subsequent treatments tend to prolong the effect. How does the skin appear after Botox®? Immediately after treatment the skin appears normal as there may be some redness and swelling at the treated sites. Occasionally, there can be mild bruising. If present, these changes resolve within a few hours to days. The skin feels normal and there is no unusual sensation. As the Botox® becomes effective the skin will start to look smoother as the lines produced by muscle contraction diminish or disappear. Botox® initially takes effect in two to four days with the maximal effect seen in about 2 weeks. Yes. You may resume all normal activities immediately after treatment, BUT you must refrain from touching the area(s) of treatment for at least 1 hour after your session. By touching, pushing, or massaging the treated area(s) you may actually spread the Botox® to other muscles in the area and may cause an unwanted loss of action of these muscles and a negative effect such as an eyelid droop. You must also avoid lying on your face for approximately 4 hours after treatment. Any pressure put on the injections sites can spread the Botox to unwanted areas. Is there any discomfort with treatment? There is usually mild discomfort at the injection sites. This only lasts for a short period of time. Rarely. Botox® can affect an adjacent muscle, and it too may have reduced activity. This has been reported in about one percent of those treated. If this does develop, the most common change is eyelid drooping for injections around the eye. However, any such unwanted muscle relaxation would also be temporary. No. Extraordinarily small amounts of BOTOX® are administered. These quantities are insufficient to cause botulism or any related symptoms.